I've been with shopify a while now and had my store running for a while after expanding from just eBay, Can you guys take a look and tell me if there is anything you think i could optimise or change? Any criticisms or usability issues? Your site functions really well. It's quite fast, full of good information and easy to navigate. There are a couple things you might consider changing. • I find the monochromatic colour scheme blends your site together making some aspects hard to see. You might use a yellow to help make them pop, like the ratings stars for example, or anywhere you want the eye to be drawn most. 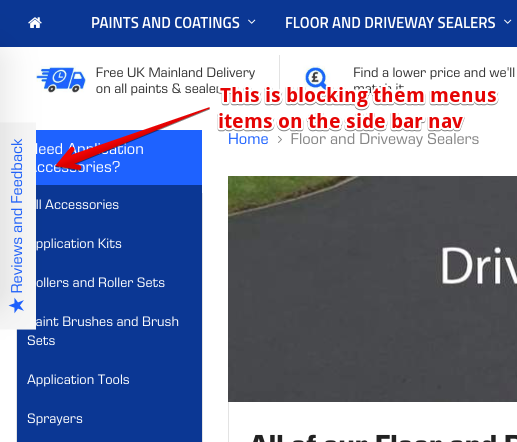 Also, considering you're a paint store using more colours might be more consistent with that industry. • The ratings pop-up on the left is blocking visitors from seeing your sidebar navigation. If I were looking for a product or category that ratings pop-up could very well be stopping me from doing that easily. • It's up for debate whether sales pop-ups actually work or not. You already have a lot of information on your site, including a fast moving slideshow, so for me the sales pop-up crosses the line into information overload, resulting in a distracted visitor. Other than those things, which are relatively small, you look to be well on your way to a successful site. I'm curious to hear others opinions. I was unaware the feedback and reviews tab was blocking the page as I use a widescreen monitor :/ thanks for that. I will change the star colour to yellow as there is a too much Blue, I was considering adding another main colour other than my 2 blues however my main competitor uses blue and orange and I don't want to copy them so I may stick with this for the moment. The previous sales pop up is a component I've added and removed multiple times at this point, it doesn't look all too great but I think the visual of previous purchases from other people helps re-assure new customers that we are a legitimate and well-established business. I may change the settings of this to look a little smaller. I need a feedback on my store!